Our R&D team follows a stage‑gate process when developing custom assays for our industrial partners. This is to drive process efficiency, ensure that we meet the quality standards our customers expect, but more importantly, to ensure that we achieve target performance specifications within the desired timeframe. Furthermore, the process prompts communication between Bioline and its partners at each key stage of the project to ensure excellent alignment and understanding with respect to the progress of the project. 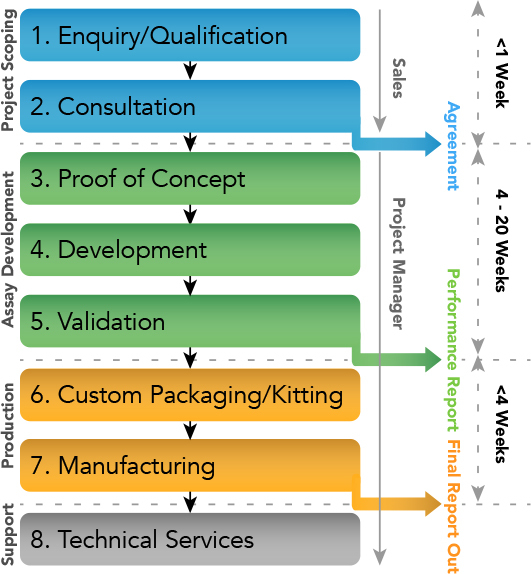 From early stage development through to manufacturing and delivery, our process is tightly controlled to ensure consistency. We offer consultation and technical support to help make design decisions, scientific expertise that matches your requirements and customized confidentiality agreements. Click here if you would like to discuss our custom assay design process, or any other needs you may have, with one of our experts. Download a short summary of our custom assay development process and the many parameters we have experience of optimizing in the pursuit of robust, accurate assay performance.